North American equity markets have registered lacklustre returns so far in 2015. The S&P/TSX Composite Total Return Index is up 0.9% year-to-date while the S&P 500 Total Return Index is up 1.2% in US dollars for the same period. The US dollar has appreciated 6.8% against the Canadian dollar, adding to US equity returns for Canadian investors. Greece has returned to the headlines following the failure to reach an agreement with creditors and the subsequent referendum where the public voted against austerity measures allowing further aid. 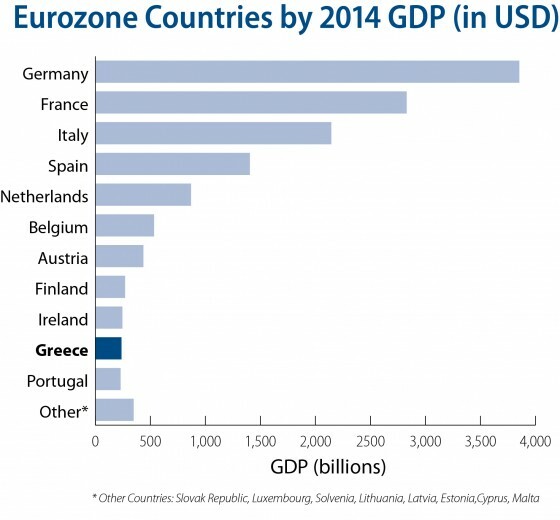 While the impact of Greece as a nation of roughly 11 million is quite small on the world stage, its position as the first nation to potentially exit the European Union is very much the focal point. The consensus view is that the referendum is not necessarily a vote to leave the EU, instead it is a negotiating tactic to seek more favourable terms from creditors. Push really is coming to shove in the Eurozone where leaders are faced with three main alternatives: allow the Greeks to exit and face a potentially destructive default and currency devaluation; pave the way for an orderly exit from the EU that includes a bailout; or completely bail out Greece and allow them to stay in the EU. It appears there is virtually no prospect for avoiding either the moral hazard of a bailout or a precedent for leaving the EU, putting European financial leaders, principally Germany, in a difficult position. Our view is that any impact from the “Grexit”, should it come to that, will prove relatively temporary and should be well contained. Greece’s financial problems have been well advertised and players betting on the solvency of the Greek government did so with relatively known risks (Greece lost its investment grade credit rating in 2010). This differs from the 2008 financial crisis where an increasing amount of global investors were betting on mortgage-backed securities that even the esteemed rating agencies that stamped them AAA did not understand. While the events in Greece are fascinating, they have little long-term effect on the companies we own. We have no doubt the Greek people will continue to drive cars, use electricity and download ever increasing amounts of data from the internet, and we know Canadians will continue to do the same. As long-term investors, we try to assess the risk that dividends will be cut as a result of current and potential events. On that basis, Greece does not pass the worry test, but volatility likely will continue to ensue until a steady state is reached across the Atlantic.